This article was originally written for The Incubator. Feel free to read the article there and check out my cohort’s opinion on the cupcakes we devoured! I have a strange obsession with cupcakes. Ever since I first discovered the idea of cupcake shops about three years ago, I’vebecome somewhat of a self-proclaimed cupcake expert. I worked at a cupcake shop for a summer back home. I wrote an essay about the cupcake phenomenon. And of course, I’ve eaten an absurd amount of cupcakes. I’m also pretty fanatic about Baked & Wired, a coffee shop in Georgetown that also serves an array of delicious baked treats —including cupcakes, lots of cupcakes. You would think two and two would go together, and I would have long ago engorged myself on some Baked & Wired cupcakes. But somehow, I never got around to it. I was always waiting for “the right time.” That time finally came a few Saturdays ago, when fellow AU Gourmet blogger Abby Fennewald and I decided to start a series about cupcakes in D.C. Look out for her post to come. Together, we ventured to the slightly tucked away shop. Although it’s a bit of a hike (and by that I mean it’s off M Street) it’s well worth the walk. As soon as you cross the threshold, you enter a friendly and relaxed shop. Head to the right to get coffee, the left for baked goods. That’s where we wanted to go. Looking at the row of cupcakes, each on their own little pedestal, I thought I would never be able to choose. All the workers were more than willing to help by chiming in with their favorite flavors. Finally, we each picked — Abby got strawberry and I got chocolate mocha — with a promise to share. Finally the moment was upon me: my first bite of a Baked & Wired cupcake. I unwrapped the parchment paper, opened my mouth wide, and relished every second. 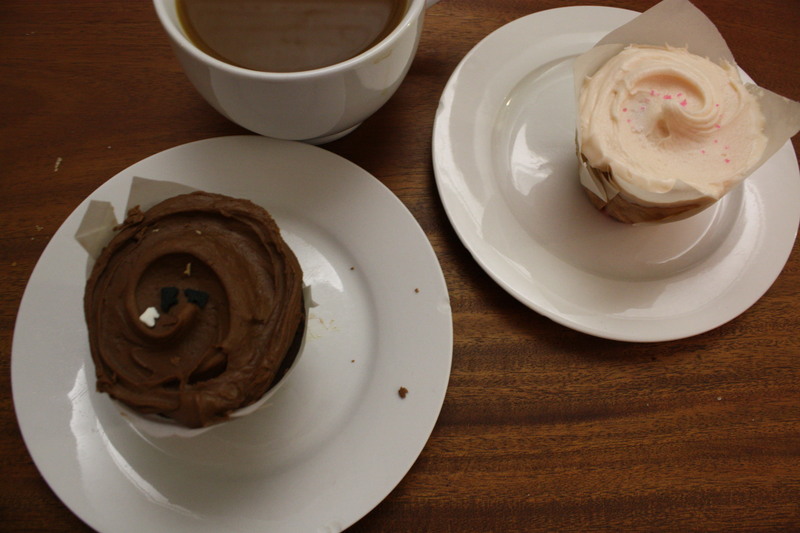 The cupcake was good: a dense, deep chocolate cake with mocha-flavored frosting. The frosting on top was not a toppling mound like at most cupcake shops, which created my perfect frosting-to-cake ratio. There wasn’t as much coffee flavor as I would have liked, but I guess that’s what you buy coffee for. Abby’s strawberry cupcake, however, was to die for. It is the only strawberry cupcake I have ever liked, which is probably due to the real pieces of berry baked into the batter. I liked it so much, that I ended up buying another at Taste of Georgetown later in the day. Baked & Wired cupcakes were certainly delicious (especially the strawberry). Keep an eye out for future installments of Baked and Sprinkled to see how they stack up against other D.C. cupcakes. Have a store you want us to review? Comment and let us know and we’ll be sure to check it out!